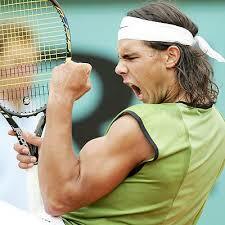 Rafa Nadal letting his passion show! Oh, I know I could improve my writing. I even know how I could improve it immediately. I’ve done the course, I know the answer, trouble is I’m chicken. All writers have to think of something to write about, and yes, most can probably pull things out of thin air fairy easily. What doesn’t come so easily to some of us is the being brave bit. Being brave with our emotions, exposing our feelings, putting our head above the parapet. My family, especially my own childhood, is ripe with entertaining and bizarre episodes, certainly enough to fill a book, but when I put them down on paper it feels like a betrayal. Not only that, but bringing them to the surface and turning them over to reveal the juicy bits can be quite painful, so I inevitably end up deleting or destroying what had the potential to be something much deeper than some of my other drivel. I envy other bloggers who write impassioned pieces about society or current affairs. I wouldn’t touch them with a bargepole. Of course, like them, I have strong views about many aspects of this modern world, but to voice them in public? Goodness me, I might get some dodgy feedback, disagreement, or, heaven forfend, unfollows. Now, I do understand it’s good to start, and take part in, debate. But I’ve always been a cissy on that front. Always nodding agreement rather than saying what I really think. I guess I’m not alone there. In fact there’s a weekly column in the Guardian Magazine called ‘What I’m really Thinking’ which proves to me that many of us choose the polite path. And quite right too. It would be very wrong to spend our lives being absolutely open and frank about every little thing. But with writing, well, somehow we know that brutal honesty, that opening of the soul, is really what produces the best results. I’m quite sure all that would make for a better read for you all, but I guess I’ll not be doing it just yet. I’m still a wimp. P.S. By the way, while I’m being honest, I’m wondering now if this whole post wasn’t really just an excuse to use a picture of Rafa Nadal! This entry was posted in Uncategorized and tagged life, Nadal, passion, Rafa Nadal, revealing, writing. Bookmark the permalink.